This pork tenderloin barbecue recipe is one of my favorites. Pork tenderloin is delicious and tender alone, but with this brine it reaches new heights! On its own, pork tenderloin, because it is so lean and lacking in fat, can have a tendency to dry out. Also, the flavor of the pork alone is mild, just inviting some other bold flavors to liven it up. 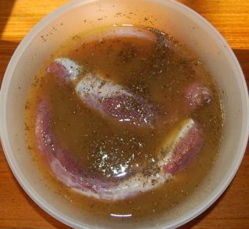 Brining is a means of flavoring meats while preserving their fluid content so that they don't dry out when cooked, staying succulent, rich and tender. Pork takes particularly well to brining but some poultry can also benefit from similar treatment. Part of the beauty of pork tenderloin is that it is relatively cheap. While beef tenderloin (filet mignon) can be very expensive, pork tenderloins can be had for cheap! Pork tenderloin - 1.5 to 3 pounds or so. You want the whole pork tenderloin for this barbecue recipe. While you can use the rest of the loin, the best meat is the narrow, tapered tenderloin. I just use that, not the whole loin. However, you can use the same brine for other cuts of pork such as loin chops. 4 cups apple cider - preferably unfiltered, do not use plain apple juice as this often has lots of water and sugar added. Herbes de Provence - A mix of herbs native to the south of France such as rosemary, thyme, lavender, fennel, sage, etc. Mix the cider, water, salt, sugar, pepper, sage and cinnamon together in a large bowl. Mix thoroughly until all the sugar and salt have dissolved. Poke the tenderloin several times with a fork and add to the brine. Cover the tenderloin with a plate or spoon to keep it completely submerged. Cover in a large bowl or tupperware and refrigerate overnight or up to 2 days. Drain the brine and discard. Rub the surface of the pork tenderloin with a couple tablespoons of olive oil. Sprinkle with freshly ground black pepper and a couple large pinches of the herbs and push them into the surface of the meat with your hands. You don't need to add additional salt before cooking since the brine had a high salt content. Prepare a basting mixture of a few tablespoons of apple cider, a tablespoon of herb red wine vinegar and a tablespoon of brown sugar. Grill the tenderloin on a barbecue or fire pit. I prefer to lightly sear the pork tenderloin on all sides over high direct heat first for this barbecue recipe. Then I move it to a slightly less hot part of the grill, cover the grill and let it finish cooking there. Baste the pork tenderloin occasionally while cooking. The tenderloin is rather small, so it cooks quickly. When it feels like it is firming up, start to test for doneness with a meat thermometer inserted into the thickest part of the meat. For this barbecue recipe, I like the internal temperature to be about 150 degrees. By the time it is done, it should have acquired a nice glazed, caramelized surface color. Remove the tenderloin from the grill, place on a platter and cover with aluminum foil. Let the meat rest for 15 minutes before carving it, slicing it neatly into medallions. Serve one or more medallions to each guest along with your favorite accompanying side dish. I particularly like serving this with a side of caramelized onions. Other cooking tips: I like to add some nice smokey flavor by using some smoking chips when cooking this recipe. While apple wood is an obvious choice for this barbecue recipe, it can work well with others like hickory as well. If you prefer, this recipe can be made in the kitchen, first searing the tenderloin in a pan and then roasting at 450 degrees while basting until the interior temperature is 150 degrees. Done with the pork tenderloin barbecue recipe page?